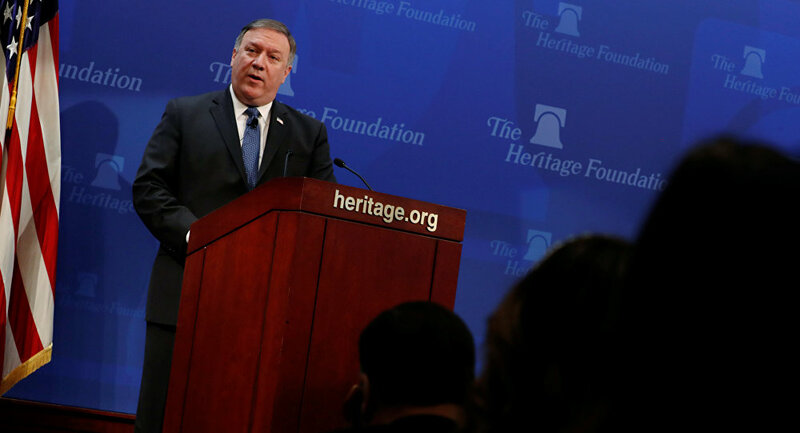 US Secretary of State Mike Pompeo has addressed the Heritage Foundation in Washington with a speech regarding the future US strategy towards Iran after Washington unilaterally withdrew from the JCPOA in May 2018. US Secretary of State Mike Pompeo, in his speech "After the Deal: A New Iran Strategy" at the Heritage Foundation in Washington, promised that the US will apply unprecedented financial pressure on Tehran via sanctions. He claimed that the "sting of sanctions" will not ease until Iran changes its course. According to the US secretary of state, the new sanctions will be the "strongest in history" and will make Tehran battle to "keep its economy alive." The US secretary of state addressed the Iranian leaders in his speech, promising that their current activities would be "met with steely resolve." He announced that the US is not planning to renegotiate the 2015 Iran Deal, but noted that Washington is open to dialogue with both its allies and Tehran. Pompeo promised that sanctions relief would only arrive with "tangible, demonstrated and sustained" shifts in Tehran's policies. According to him, reaching a new deal is not the key objective, but the "protection of US citizens," whose security was put at risk with the adoption of the JCPOA. The US withdrew in May from the JCPOA, also known as the Iran deal, which required Iran to maintain a peaceful nuclear program in exchange for sanctions relief. US President Donald Trump, who criticized the deal as "flawed," promised to impose new economic sanctions against Tehran for its "malicious activities." Elaborating on the future US sanctions against Iran, Pompeo noted that Washington would be sending specialists to all countries to explain the new US policy. He confirmed that any entity conducting business with Iran would be "held to account" by the US. He expressed hope that the US sanctions will be met with support from US allies beyond Europe. Pompeo believes that US allies will accept the new policy towards Iran as "the right one." The US decision to leave the agreement has sparked a cold snap in the relations with its European allies and co-signatories of the deal, namely the European Union, Germany, France, the United Kingdom, Iran, Russia, and China. French President Emmanuel Macron and German Chancellor Angela Merkel, heads of two of the EU's leading countries, attempted to convince Trump to stick with the deal, but these efforts ultimately failed. The re-imposed US sanctions will affect any company doing business with Tehran, putting European firms at risk, as they have heavily invested in Iran. European nations are currently considering options to counter possible US sanctions against their companies, such as implementing the "blocking statute" from 1996. They have also reaffirmed their commitment to the provisions of the Iran deal. The US secretary of state outlined 12 demands for Iran, with one of them being the withdrawal of all its forces from Syrian territory. He also demanded that Tehran end its support to Houthi militants in Yemen. Pompeo promised to work in tight cooperation with the Pentagon to "deter Iranian aggression," track its operatives and proxies and "crush them." He also promised to ensure the freedom of navigation in the regional waters. The US secretary of state slammed Iran's use of the JCPOA, claiming that instead of using the money pouring into the country to boost the quality of life of its citizens, Tehran used it to "fuel proxy wars" and to finance Hezbollah and Hamas. Following Pompeo's address, the Pentagon has commented on the new US strategy, vowing to confront what it described as Iranian "malign influence" in the region. According to the spokesman for the US Department of Defense, the Pentagon was assessing if the US would "double down on current actions or implement new actions." Tel Aviv and Washington are accusing Iran of sending its troops and weapons to Syria, claiming they are used to threaten and attack Israel. Tehran denies the accusations, saying that it only is only sending military advisers to Syria, which are assisting Damascus in the fight against terrorist groups. Tehran has also been accused of supporting Houthi militants in Yemen and supplying them with weapons, specifically ballistic missiles, which the Houthis later launch at Riyadh and other Saudi cities. Iran denies these accusations, claiming that it is only supporting the Houthis politically.